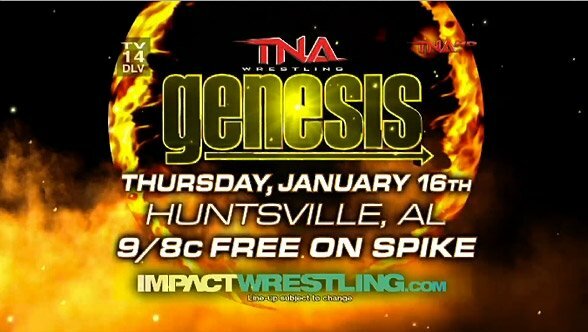 This Thursday and next, TNA will present its two-episode Genesis special in lieu of standard episodes of Impact Wrestling. In some ways, Genesis represents a soft reset for TNA, as it is their first taping of the new year and their first go-around with the new reality of Magnus as champion. Over the next three days, Dave will be reviewing the past month in Impact Wrestling action in anticipation of Thursday night’s Genesis Free-for-View (or whatever it is they call the things that used to be PPVs that they were losing money on). Here’s part one: the 12/26 show. This week, TNA presents their “Turning Point” event in lieu of a regular episode of Impact Wrestling. That “Turning Point” represents TNA’s return to Universal Studios, where they will tape two episodes of Impact over the weekend, is surprisingly, not the worst that could happen. This week’s edition of Impact Wrestling will have former champions. Okay, one former champion. Technically. Okay. It’s Adam “Pacman” Jones. We’re sorry. Last night, TNA Wrestling presented the culminating event of their wrestling year, Bound For Glory, live from the Veijas Arena at San Diego State University. Heading into the event, the nearly unanimous opinion in the wrestling world was that TNA had done a poor job making “their Wrestlemania” feel special in spite of four full months of TV time build angles. Let’s find out it was right.